The self-driving car owned by Uber that fatally struck a woman in March detected her in the road about six seconds before the crash, according to a preliminary report from the National Transportation Safety Board, which also acknowledged delayed responses from the vehicle’s automatic emergency braking system. The report confirms what Uber had previously acknowledged internally—that its software failed to properly classify the pedestrian, 49-year-old Elaine Herzberg, before she was fatally struck. The March 18 crash is the first known to involve an autonomous car fatally striking a pedestrian. The NTSB said it has not yet concluded the “probable cause” of the incident and is subject to change as the agency’s investigation progress continues, but the report offers more insight into what transpired that night in Tempe, Arizona. 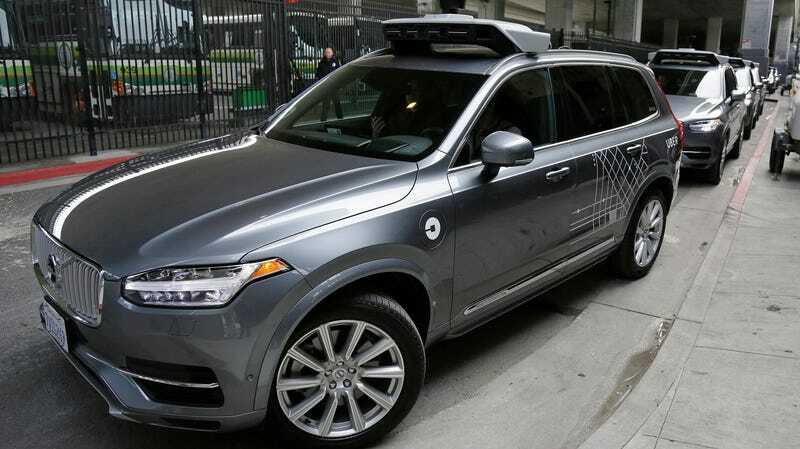 The NTSB said Uber engineers had disengaged the safety features of its autonomous Volvo XC90, as previously reported, which includes a collision avoidance function and automatic emergency braking. That’s a notable point. About 1.3 seconds before impact, the car’s system determined that emergency braking was needed to avoid a collision. But Uber disengages Volvo’s emergency braking features when the car is in autonomous mode, so as to “reduce the potential for erratic vehicle behavior,” the NTSB said. “The vehicle operator is relied on to intervene and take action,” the NTSB said. Uber had only one safety operator in the car at the time, an unusual setup in the fledgling autonomous driving industry, as Jalopnik previously reported. Most companies testing self-driving cars use two operators, so one can monitor the vehicle’s autonomous driving interface at the center console, while another keeps their eyes on the road. In a video released after the crash, the operator is seen staring down and away from the road until the moment before impact. Indeed, the vehicle operator said in an interview that “she had been monitoring the self-driving interface and that while her personal and business phones were in the vehicle neither were in use until after the crash,” according to the NTSB. “We’ve also brought on former NTSB Chair Christopher Hart to advise us on our overall safety culture, and we look forward to sharing more on the changes we’ll make in the coming weeks,” the spokesperson said. The report comes a day after Uber announced it was laying off 300 employees as part of an effort to shutter its autonomous driving program in Arizona. Police in the city of Tempe, Arizona, also said Wednesday that its investigation into the incident is complete, and now the report is being turned over to the Maricopa County Attorney’s Office for review. Under recently implemented Arizona regulations, Uber could be held criminally liable for the crash.